What is it that compels some men to risk sacrificing themselves for their nation while other men lack such courage? Time and again it is circumstance that reveals the true character of a man. Today, Marco Rubio is approaching a catastrophic defeat to Donald Trump in Rubio’s home state of Florida. With so much on the line for our nation, this is a great opportunity for Marco Rubio to redeem his once impeccable reputation. The looming victory for Donald Trump -- a.k.a. the Planned Parenthood apologist, former Hillary Clinton donor, unrepentant New York City liberal, and progressive amnesty mole -- will likely destroy the Republican Party and probably the Constitution of the United States, as well. Trump leads Rubio by 20 points in Florida according to some polls, and although Rubio is fighting furiously to narrow the margin, the reality is that Rubio is about to add just another defeat to his unimpressive one-win record. 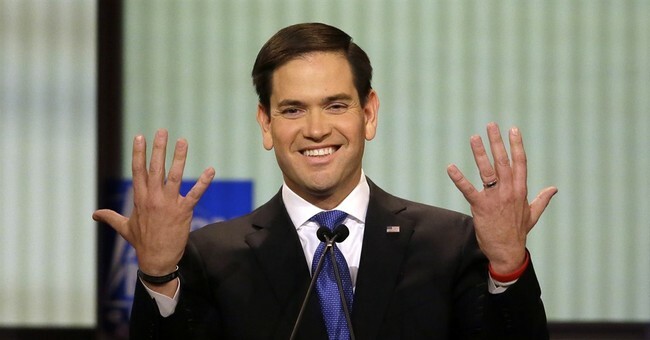 Far worse, Rubio will handover all of Florida’s delegates to the arrogant double-dealer, Donald Trump. Rubio’s personal ambition and power lust have already tarnished his judgment, integrity, and loyalty. He has previously betrayed everyone who fought to send him to Washington. In fact, Rubio’s joining John McCain as a GOP amnesty lover and a member of Chuck Schumer’s Gang of Eight remains an almost unforgivable sin. However, now is Rubio’s incredible shot at full redemption. If Marco Rubio can summon the selflessness, humbleness, and courage necessary to step aside -- before his foolish pride hands Florida and the GOP nomination to a thin-skinned narcissist much like Barak Obama -- Rubio can deliver the devastating shot to Donald Trump that the senator has been so desperately trying to land. In the military, brave men often become heroes when they act selflessly in the face of tremendous personal danger to protect their fellow warriors and ultimately to accomplish the mission. Often heroes of war do not survive their personal sacrifices. Marco Rubio has the luxury to go on living -- sacrificing nothing more than his lofty ambition to become president this time around. Rubio can walk away with his life and honor restored. He can single-handedly accomplished the mission of taking out Donald Trump. Rubio would also deserve all the credit for uniting the Republican Party. Furthermore, our country, as well as Ted Cruz, would owe Rubio far greater than a debt of honor for his sacrifice -- but nothing is more fulfilling than the satisfaction of doing what is right for the sake of our country. Granted, Marco Rubio never volunteered to face the same kind of jeopardy our nation’s warriors do, but if Rubio’s vanity ever entertained thoughts of being a true national hero, this decision is a no brainer. However, he needs to act quickly. It is a national disgrace that none of the candidates running for president have ever volunteered to sacrifice their own lives if necessary to defend the Constitution. Nevertheless, bowing out of the race before the Florida primary is Marco Rubio’s tremendous opportunity to prove himself an American patriot and to restore the lost honor and integrity to his name. Rubio’s amnesty betrayal was an expensive political decision, and he is about to pay the price for that unfaithfulness in Florida. Reputation is much easier kept than recovered. However, if Rubio will sacrifice his own ambition to prevent Trump from claiming Florida, Rubio will instantaneously recapture the reputation he squandered among his loyal conservatives who fought to get him elected. America’s warriors have given their lives for this country. It’s time for Rubio to look in the mirror. He is going to lose in Florida. Is he going to take down the entire country in a selfish quest for personal glory? I want to believe he is a better man than that. Meanwhile, Ted Cruz carried his home stated of Texas in a landslide -- while Donald Trump, Rubio, Ben Carson, and John Kasich were all sucking up votes. Cruz did not need Rubio to bow out. He got the job done when he needed to the most. However, Rubio cannot do the same in Florida. Even with Ben Carson now having sacrificed his own ambition to lead this nation, Rubio is going to lose to Trump. The best Rubio will do is narrow the margin to less than 20 points. Rubio lost too many voters by supporting amnesty. He has no one to blame but himself. The writing is on the wall. Ted Cruz is in the best position to defeat Donald Trump and to become the Republican nominee. But Cruz needs a fellow patriot to have his back. If Rubio refuses to hold down Trump in Florida by getting behind Cruz, Marco Rubio will have betrayed our country a second time. I pray Rubio will take a moment to think about the sacrifices America’s warriors have made on behalf of this nation. It’s time for Rubio to put his ambition and pride aside and do something selfless for his country. I sincerely hope Marco Rubio has the character to do it.